With AWS, we can smoothly process billions of events daily with 24/7 reliability, and can scale quickly to meet spikes in demand. Known for creating the in-image advertising category, GumGum provides products based on its patented image recognition technology, delivering programmatic, native, and social analytics software solutions. Reaching 400 million visitors as they view images and content across more than 2,000 premium publishers, GumGum reports that its customers’ ads benefit from 20 percent higher viewability—a metric for tracking impressions likely to be seen by viewers—and 10 times the engagement of traditional display options. This results in superior brand lift for marketers and increased revenue for publishers. The company works with more than half of AdAge’s top 100 U.S. advertising spenders, including Disney, L’Oreal, Toyota, and Samsung. GumGum is headquartered in Santa Monica, California, with six additional offices in the United States and the United Kingdom. Generates more than 1 billion events (approximately 6 TB of data) every day. Needed a solution that could scale quickly to handle rapidly growing traffic and data. Needed to process data continuously to eliminate bottlenecks and expedite customers’ decision making. Runs ad servers that generate events data, which is written to logs and uploaded to Amazon Simple Storage Solution (Amazon S3) hourly; stores output in Amazon Redshift. Uses Amazon Data Pipeline workflow services for production, testing, and development. Uses Amazon Elastic MapReduce (Amazon EMR) to run Apache Spark for inventory forecasting and Hadoop for hourly data processing. Provides users with proprietary dashboard that displays data from reporting server. Speed and availability: Processes about 6 TB of data nonstop every day with AWS Data Pipeline. Scalability: Can quickly adjust to accommodate peak data periods. Lower costs: Company can cost-effectively expand its services as new customers sign on. 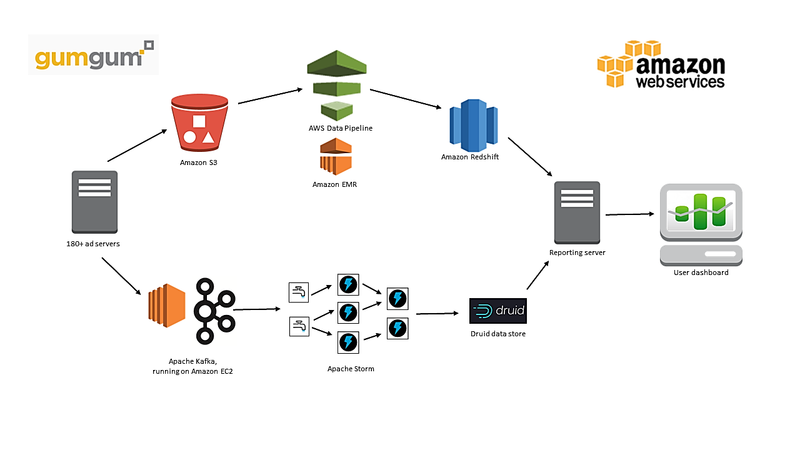 The GumGum data workflow using AWS. To learn more about how AWS can help you your data pipeline processes, visit our Amazon Data Pipeline details page: http://aws.amazon.com/datapipeline/.